Winterground Fairlands - A World Of Funmagineering! 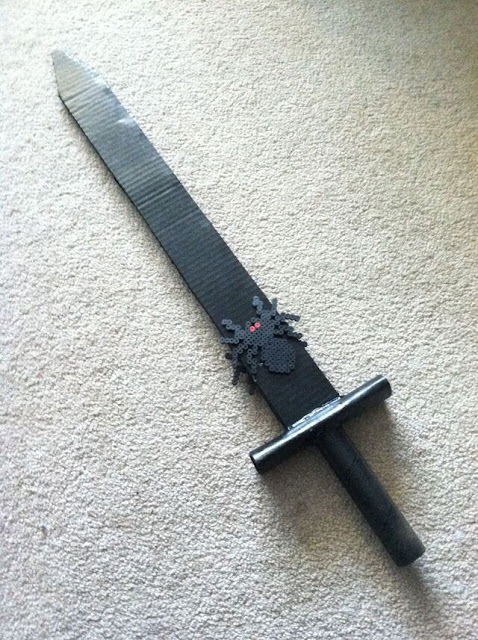 : Sword for The Spider Ninja! A new attraction is opening up at Winterground Fairlands! 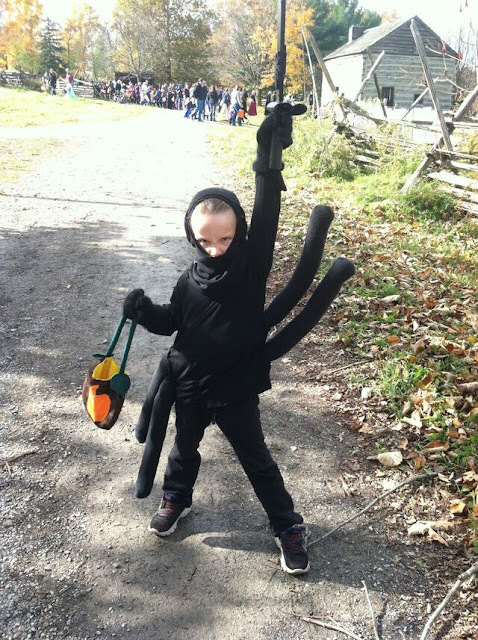 "The Adventures of the Spider Ninja" It's an exciting attraction with Spider Ninjas, and various challenges and action and probably a lot of running around with swords. This attraction required costuming to create something all new for the cast members. Shown in the picture is Jasper with his uniform. The ninja mask and spider outfit were created by Pam the Costumer specifically for Jasper's small frame. 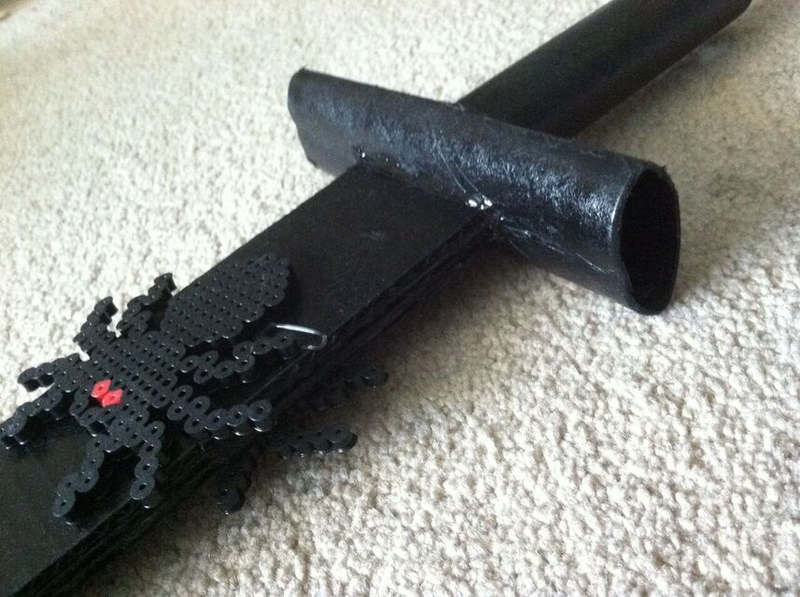 The new swords were built using various corrugated cardboard products. The blade was made by rubber-cementing three layers of cardboard together, with their "grain" going in different directions for strength. The blade actually continues through the hilt and into the handle, much like a real metal sword. The handle is just a piece of thick cardboard tubing originally from wrapping paper. It has a smaller diameter and is stronger than paper towel tubing to accommodate the cast member's smaller hands. The hilt was a paper towel tube, with a round hole on one side to accept the handle, and a rectangular hole on the other side to accept the top portion of the blade. 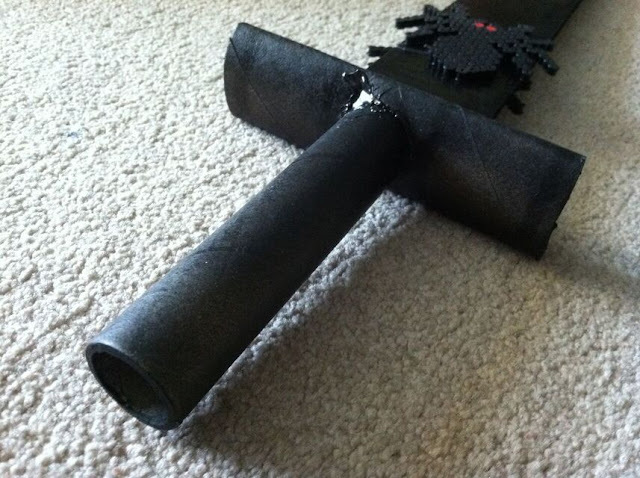 Once the blade is pushed through the hilt and into the handle, everything fit very snugly, and didn't need any additional adhesives... but just in case, and for extra strength, the hilt was loaded up with lots of hot glue, and additional glue was added around the joints from the outside. A couple coats of plain 'ol black spray paint and then the fine detail work could be done. Jasper added some spiders he made out of Perler beads and the sword was completed!